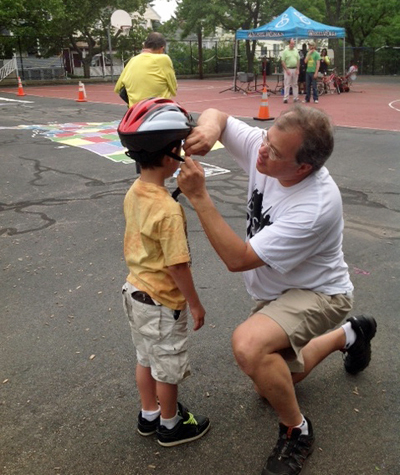 Bike Safety Day in Somerville is always a great way for children to kick off a summer of safe bicycle riding. This year, Breakstone, White & Gluck was pleased to participate, donating 175 helmets to the Somerville Kiwanis Club for distribution to children from the Winter Hill Community School. Over 130 children were fitted for helmets that day and the school was given the rest to give students individually as needed. Above photo includes: John Welch, Winter Hill School Re-Direct Officer; Somerville Police Officer MaryAnn Manfra; David Blumsack, Somerville Kiwanis Club Event Organizer; attorney David White of Breakstone, White & Gluck; George McLean of the Somerville Kiwanis Club; Nancy Bushnach of the Somerville Kiwanis Club and Ellen O’Brien of the Somerville Kiwanis Club. The event is hosted annually by the Somerville Kiwanis Club and was held at the Winter Hill Community School playground on June 22. Children who registered in advance came out with their bikes for a free inspection, helmets and reflectors. Children and parents then had to test out their new skills on bike safety obstacle courses. 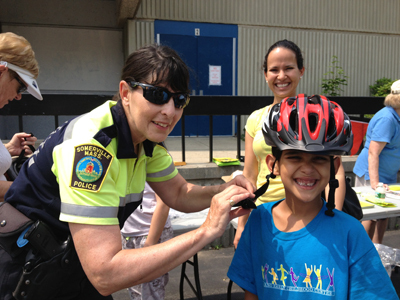 As part of the event, children registered their bikes with the Somerville Police Department and were given fingerprinting kits. The helmet donation was part of Breakstone, White & Gluck’s Project KidSafe, launched this year. To date, our firm has donated over 900 helmets and is on track to donate 1,000 by the end of summer. Our Boston lawyers have donated helmets to children in need through these programs: Boston Bikes’ Roll It Forward program, CYCLE Kids in Cambridge, Boston Cyclists Union and the Dedham Bike Rodeo. Bikes Not Bombs of Jamaica Plain was given a monetary donation to support its youth programming. Above: Attorney David White of Breakstone, White & Gluck of Boston. Below: Somerville Police Office MaryAnn Manfra. The lawyers at Breakstone, White & Gluck specialize in bicycle accidents and injury cases in Massachusetts and promote safety through education. Our bicycle helmet campaign is aimed at protecting children from serious head injury in bicycle accidents. In Massachusetts, wearing a bike helmet is required for cyclists who are 16 years of age or younger. It is also the most effective way for cyclists of all ages to prevent a serious head injury. 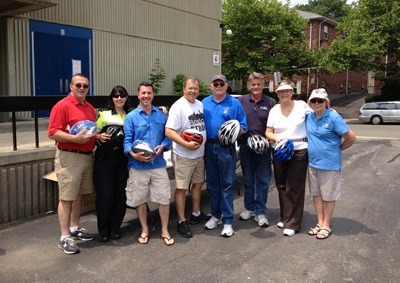 To learn more about our bicycle helmet donations, visit us at www.bwglaw.com/bikes.